What is happening to my neighbourhood? The socio-spatial restructuring of Vancouver, Calgary, Toronto and Montréal, 1970 to 2015. Lecture by David Hulchanski, University of Toronto, NCRP Principal Investigator, The 2017 SFU Warren Gill Lecture, Simon Fraser University City Program, 1 December 2017. 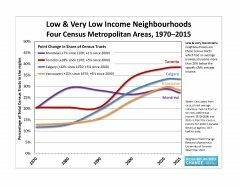 Neighbourhood income trends comparing Vancouver, Calgary, Toronto and Montréal, 1970 to 2015. Vancouver Census Metropolitan Area (CMA), income maps, 1980, 1990, 200, 2015. 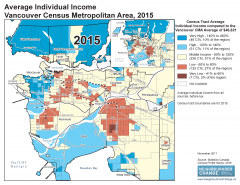 City of Vancouver, income maps, 1980 and 2015. Vancouver area income and population change bar charts 1970 to 2015, for Vancouver CMA, City of Vancouver, Burnaby, Richmond, Surrey, North Vancouver, New Westminster. 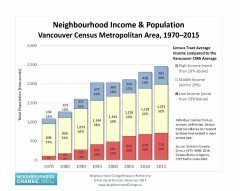 An avalanche of money: An expert on how income disparities are reshaping Canada’s metropolitan areas zeroes in on Vancouver, by Kerry Gold, The Globe and Mail, 7 December 2017. Mapping out Vancouver’s growing divide between rich and poor: The trend is similar in Canada’s other big cities, where researchers have mapped how neighbourhoods have changed since the 1970s. by Jen St. Denis, Metro, 5 December 2017. Goodbye to the Vancouver we know? The city has more than housing at stake. Inequality, segregation and displacement are destroying what makes Vancouver special. by Christopher Cheung, Metro, 22 December 2017. The Man Who Predicted Vancouver Real Estate: Podcast featuring UBC Geography professor David Ley who has done extensive research on gentrification and its effects on real estate in Vancouver. Vancouver Real Estate Podcast #95, 16 November 2017. What Do We Mean By ‘Affordable Housing?’ If we’re to solve this crisis, we need to agree on what defines affordability, and for who. by Christopher Cheung, TheTyee.ca, 7 August 2017. Why the Struggle of Renters Is Canada’s ‘Ultimate Housing Problem’: Being a low-income renter is terrible. Here’s how it got that way. by Christopher Cheung, TheTyee.ca, 26 May 2017. New study: Vancouver housing market fuelled by Chinese buyers. by Kerry Gold, The Globe and Mail, 2 November 2015. As Seattle market mirrors Vancouver’s, housing experts search for answers. by Kerry Gold, The Globe and Mail, 24 March 2017. Should Developers Meet Quotas for Affordable Housing Units? ‘Inclusionary zoning’ has worked in US cities, but is tricky to get right. by Christopher Cheung, TheTyee.ca, 13 January 2017. Vancouver’s Flimsy Foreign Tax: The 15 percent charged to offshore buyers won’t slow the real estate market—there are too many loopholes to make it effective. by Kerry Gold, The Walrus, 15 August 2016. The Highest Bidder: How foreign investors are squeezing out Vancouver’s middle class. by Kerry Gold, The Walrus, 30 May 2016.
by David Ley & Nicholas Lynch, Research Paper 223, Neighbourhood Change Research Partnership, University of Toronto, August 2012. The Growing Urban Class Divide, Vancouver Edition: The segregation between the rich and poor is clearer than ever. by Richard Florida, CityLab, 14 November 2012. This paper examines growing inequality (the gap between rich and poor) and growing polarization (the numbers of rich and poor) in the Vancouver metropolitan area, and shows how these differences play out spatially through the region’s different municipalities and neighbourhoods. A study of Toronto, known as the “Three Cities” report, shows that since 1970, the city has become increasingly polarized between affluent neighbourhoods toward the centre (City #1) and larger numbers of disadvantaged neighbourhoods on the edges characterized by social exclusion in terms of employment opportunities, public services, and urban transit (City #3). Sandwiched between these extremes is a large group of more or less stable middle-income neighbourhoods (City #2). Are similar trends apparent in Vancouver? We studied the City of Vancouver’s 23 neighbourhoods and 15 principal suburban municipalities, and found considerable transformations in both demographic and economic characteristics in the past few decades. We have identified ample evidence of a new geography of rising income inequality and polarization in metropolitan Vancouver from 1971 to the last complete census in 2006. David Ley is the Canada Research Chair of Geography at the University of British Columbia. His research interests include the older neighbourhoods of large cities and the social groups that experience them and attempt to shape them. He has also done considerable research on immigration and the city, as part of the Vancouver Centre of the Canadian Metropolis Project on immigration and urbanization. Nicholas Lynch is pursuing a Ph.D. in urban social geography at the University of British Columbia. His research focuses on urban residential development in Toronto and Vancouver.